Ideally, a music reviewer will exhibit a sense of subjectivity as he or she heads into a fresh review. It’s kind of our job. But we are human, some opinions to the contrary, and not only do we end up with artists we enjoy, we also have those whose next work we truly look forward to. For me, Darshan Ambient is one such artist, which is why these last few months have been difficult for me. You see, I review strictly in order of when releases were sent to me and I don’t move people up in my queue just because I happen to quite like their work. 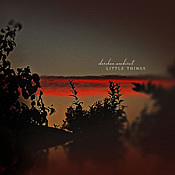 So here is Darshan Ambient’s Little Things, which came to me back in August, and only now can I sit down and thoroughly immerse myself in Michael Allison’s latest. And let me tell you that while the wait was not easy, it was worth it.Here we have another graceful blend of contemporary instrumental pieces, lightly spiced with world and jazz flavors, laid-back and deep, with just the right amount of catchy hooks hiding in the flow. Allison notes that with this disc he has gone back to his ambient roots; you certainly hear it in the swirling washes that greet you as “UnUsual Thursday” opens the proceedings. Those washes then shift toward the back as Allison layers in a melody to take the piece in a more New Age-ish direction. “Soft Portrait” is an Eno-esque pairing of slow and simple phrasing repeating on piano, respecting the harmonic contributions of its resonant tones, with quiet pads to sing counterpoint. Another take on this is offered up on the title track, which almost feels looped. A basal phrase begins repeating itself, gets a bit more electronic texture, then meets a similarly restating piano phrase. Allison slowly deepens the layering and the flow, and creates a piece that’s more than a bit hypnotic. What makes Little Things, outstanding, however, is its diversity. Yes, there are pieces with that ambient timbre, but then there are tracks like “W. 52nd,” which brings us more of Allison’s cool trumpet, the kind we enjoyed on his Miles Davis-themed Dream In Blue. (And it may just be me, but I always catch a hint of Mark Isham phrasing in Allison’s horn.) This is one of a few tracks with a nice world flavor to it, and that jazz edge. There is also some delicious slide guitar work throughout the album that really catches my ear. It speaks up beautifully in “Shadow Country,” over hand percussion and an understated bass riff that holds down the rhythm. I also like it in “There!,” which opens with a rush of string sounds echoing Steve Reich and then blossoms thanks to the slide, which takes on a slack guitar sound that practically has a paper umbrella sticking out of it. Little Things is a true pleasure to listen to. Allison is a craftsman and a talented multi-instrumentalist who infuses every song with tons of pure feeling. This is a pensive and personal disc, a perfect end-of-day listen that will have you in its hold down to the last perfectly hanging note of the soundtrack-worthy closing piece, “Exile.” Don’t wait like I had to; listen to this now.